Ph.D. John Jaquish’s journey to inventing a device that dramatically improves bone density began the day his mother learned she had osteoporosis. When osteoporosis is diagnosed—usually after a bone break—most doctors prescribe medications that either slow bone loss or increase bone formation. However, these medications come with hefty side effects that range from inconvenient and disruptive to painful and sometimes fatal. Jaquish, who studied biomedical engineering research at Rushmore University, didn’t want his mother to suffer from osteoporosis or medication side effects. He began an intensive research process to learn more about aging and osteoporosis, and he eventually developed a unique device that can dramatically increase bone mass. Jaquish’s mother is now in her 80s and has the bone density of a 30-year old woman. She has never taken osteoporosis medication. Osteoporosis causes bones to become so weak or brittle that even movements as mild as coughing or bending over can cause a bone fracture. According to the International Osteoporosis Foundation, osteoporosis leads to a bone break about every three seconds worldwide, and one in two women and one in five men over age 50 will suffer from an osteoporotic break in their lives. Healthy bones are constantly breaking down and rebuilding, but the rebuilding process slows dramatically with age. 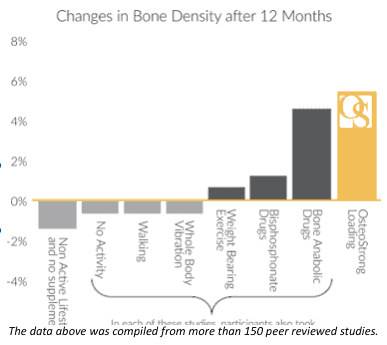 People reach peak bone mass in their early 20s, but in middle age, bone density plummets because bone deteriorates faster than it can rebuild. Doctors tell patients that exercises such as walking, climbing stairs, and lifting weights can help build bone density. However, the numbers from recent research show that exercise doesn’t build nearly as much bone density as we once thought. Though exercise is good for your overall health, exercise alone does very little to reverse the effects of osteoporosis. Intense weight bearing exercise does build bone mass, but the results are only notable with very high amounts of weight. The general thinking on the subject of weight training has been that the greater the pressure on the bone, the more the bone will respond by rebuilding itself. Activities such as walking, yoga and vibration plate exercises may at best slow the rate of bone loss, but research shows that after age 50, these activities can’t add bone faster than it deteriorates. Jaquish’s research on cellular biology, longevity, endurance and bone density led to two major discoveries. He read that in 2004, the U.S. Surgeon General published a report saying in order to increase bone density, someone must endure the pressure of multiples of their body weight. Similarly, a 1999 peer reviewed study found that a person could not increase their bone density faster than they were losing it unless they experienced resistance of at least 4.2 times their body weight. Based on this research, Jaquish designed a device that could create the ideal set of triggers to safely build new bone. His patented machine was based on a set of brief, safe, osteogenic events that take less than 10 sweat-free minutes a week. The sessions are easy, monitored by a trained technician, and trigger the body’s natural adaptive rebuilding responses. The body then goes to work building new bone. The process is called osteogenic loading, and it’s changing the way people are thinking about increasing bone density. Jaquish learned that when done properly, osteogenic loading could improve bone density, strength and balance in less than 10 minutes a week. His subjects, ranging from ages eight to 98, didn’t even break a sweat during their weekly sessions. Osteogenic loading goes far beyond the minimum established trigger for building bone, so it’s incredibly effective for most people and delivers results quickly. “Without reaching the right amount of resistance, people saw little improvement. Multiples of more than four times a person’s body weight is the key, and going higher is even better,” said Jaquish. Research on osteogenic devices is relatively new, but the data is promising. Osteoporosis International, an international multi-disciplinary journal sponsored by both the International Osteoporosis Foundation and the National Osteoporosis Foundation of the USA, published Jaquish’s 2013 study showing that bone density improved 7.34 percent between the spine and hip over one year of treatment. Another study conducted by the government of Great Britain, which is expected to be published in August of 2015, included 52 post-menopausal women who showed an average increase in bone density of over 9% in the lumbar region. This non-biased, tax-funded study showed far greater increases than any other modality in our analysis of 152 studies. 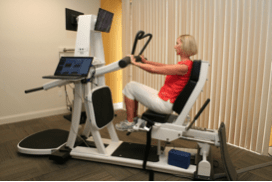 Wellness company OsteoStrong is the first and only traditional franchise concept offering Jaquish’s system to the public. OsteoStrong began offering this patented osteogenic loading system in September 2012, and to date, thousands of people have experienced the benefits. The hallmark of OsteoStrong centers across the U.S. has been the testimonial success stories shared by members. People have quit their osteoporosis medications, experienced total osteoporosis reversal, and DXA scan readings show women and men over the age of 60 who now have the bone density of a 30-year old. Traditional exercise has many benefits, especially improvements in cardiovascular health, endocrine function, and flexibility. However, if increasing bone density is the main goal, exercise alone likely won’t be enough. For those looking to prevent fractures and increase bone density, OsteoStrong might be the answer—since the first session is free, it’s definitely worth a try. Kyle Zagrodzky is president and founder of OsteoStrong Franchising, LLC, a wellness company that’s helping thousands of members build stronger bones, strength, and balance in less than 10 minutes a week. The OsteoStrong system is based on scientifically proven, patented osteogenic loading technology that can build significant bone density and even reverse osteoporosis. So this is basically an advertisement, not a genuine research article. Nice try.